The wedding money dance can be one of the highlights of your wedding. But the success of it can depend on a lot of things. In families where the money dance isn’t the norm, it can seem like a weird way of asking for a cash gift. Some families or cultures consider it a must tradition to be included. Like almost every tradition, what might seem rude to one couple may be totally appropriate and meaningful to another. What’s that mean for you? Well, when you are choosing whether to have a wedding money dance at your wedding, think about your family and friends expectations. Use your judgement as to whether to skip or modify this tradition for your guests. One way to approach this situation is to explain what a money dance represents. Have your wedding DJ or band leader explain the custom. Another good way is to have printed cards at your guests table. 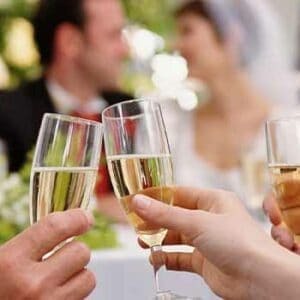 To get some ideas on what to write, do some research on wedding traditions. Most guests in American culture purchase gifts either on their own or thru your wedding registry. By including that a wedding money dance is going to be part of your wedding, they will be able to decide which gift option they would like. Quite frankly, we don’t carry as much cash with us due to credit card usage. A heads up will give your dance a chance to succeed. ARE THE ALTERNATIVES TO THE WEDDING MONEY DANCE? 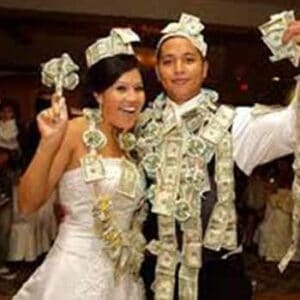 If you want to do wedding the money dance, but you know your guests aren’t familiar with the tradition, you have some options. You could invite everyone to the dance floor to shower you with faux money, slips of paper with their well wishes or flower petals instead. Taking the time to think about your guests and what activities would work for your wedding will help make your wedding a success. As a professional wedding dj, we are experienced in helping your choose the perfect events for your wedding. Call us today! Having a professional wedding dj at your wedding can help to ensure the success of your wedding. Find out more by clicking below.